PGiC was involved in the organization of the symposium Ecogames: Game Research meets Sustainability, in which game designers and scholars from a variety of disciplines came together to discuss the impending impacts of climate change and possible ways to counter this. It explored the psychological, social, cultural and institutional conditions of a transition to a sustainable society, and the role ecogames could play in such a transition. Four Dutch game studios and creative storytelling agencies (Grendel Games, Spektor, Organiq and Play the City) presented their media productions and will discuss how these productions can be understood as rhetorical devices. 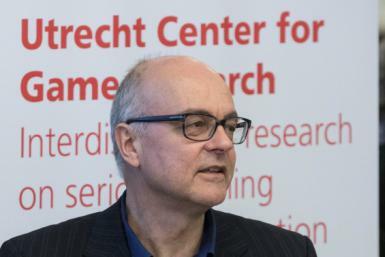 During the symposium, Prof. Joost Raessens referred to an alarming conclusion from the Netherlands Institute for Social Research, which found a big gap between national and international policy on the one hand (such as the Paris Climate Agreement, the Dutch Energy Agenda and the Dutch initiative for a climate bill) and the lack of concern among the Dutch population on the other hand, for whom the topic of energy transition is not a high-interest topic. According to Raessens, ecogames such as the Wijk & Water Battle (Grendel Games) and From 5 to 4 (Organiq) can play an important role here by raising awareness of a variety of sustainability issues, by reinforcing sustainable attitudes and behaviour and by stimulating collaborative sustainable decision-making.